if you can't say something nice. . . 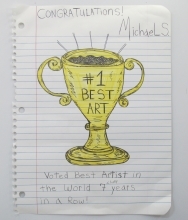 Embarrassment, failure, dark secrets, anxiety, obsessive repetition, moments of self-deprecation tempered by hyperbolic flights of self-aggrandizement: it's all part of the scribbled, sketched, and handwritten work of Michael Scoggins. 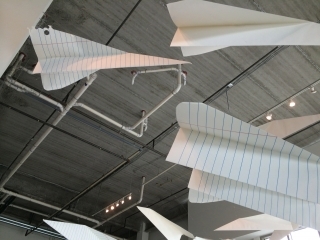 Supersized sheets of lined composition paper become the blank canvas for confessional narrative, vulnerable pep-talks, and gleeful boasts (“#1 Best Art”). While his practice may have something in common with the oversharing '90s impulses of an artist like Sean Landers, Scoggins channels his ruminations through the guise of “Michael S.,” a sort of avatar of his own youthful self. The exhibition includes a number of notebook drawings whose subjects range from the personal to the political. In one, the phrase “One Trick Pony” repeats twenty five times—a diminutive phrase tossed at Scoggins during a grad-school critique, now cheekily repurposed. A large diptych piece has “Michael S.” writing the phrase “I'm Not Scared” over and over, a way to explore an interest in the way language can shift and break down through repetition. 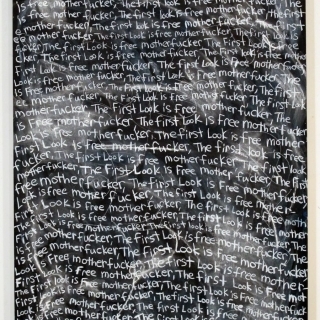 Other works are less about legibility and more about what the artist fails to reveal. A series of chalkboard drawings find Scoggins writing, rewriting, and then erasing, the full narrative hidden behind blur and smudge. “The chalkboard is ephemeral in nature,” he says. “I'm building up layers of history, and also thinking about memories, and how they're flexible and change over time. The viewer is only getting part of the story; I hope they'll complete the missing parts.” These newest drawings also find the artist reaffirming his fascination with graphite's potential: In one, the words “The United States of America” float above a body of text that has been completely blotted out by an impossibly dense block of graphite. There's a physical mass, a nuanced surface-sheen, in this monument to markmaking—and a gesture that Scoggins finds painterly, despite the lack of paint. Michael Scoggins was born in Washington D.C. in 1973 and grew up in Virginia. He relocated to Savannah, Georgia and earned an MFA in painting from the Savannah College of Art and Design in 2006. In 2003 he attended the prestigious Skowhegan School of Painting and Sculpture in Skowhegan, Maine. 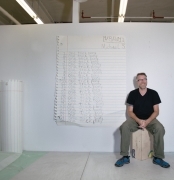 Recent projects include “When Johnny Comes Marching Home,” an exhibition at Gettysburg College, and a large-scale chalkboard commission as part of the Bass Museum in Miami's “Temporary Contemporary” program. His work is incuded in the collection of The Museum of Modern Art (NY), the Hammer Museum (LA), among many other prestigious public and private collections. Scoggins currently lives and works in Brooklyn, NY. Please join us for a reception with the artist on Saturday, Nov. 8th from 6-9pm. The exhibition is accompanied by a 150-page full-cover survey catalog of Michael Scoggins' career with essays by Scott Indrisek and Doug McClemont, and a preface by Nick Lawrence. For more information on the exhibition, or to purchase a catalog, please contact nick@freightandvolume.com or call 212-691-7700. Michael Scoggins gave a studio tour to the good folk at Artnet. His exhibition "If You Can't Say Something Nice..." opened this past weekend at Freight and Volume. "Whether language is used for emphasis, to communicate specific meaning, draw out a narrative or simply to make a joke, it always proves to be a potent means of expression. 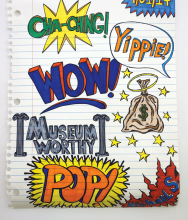 By focusing on artists who pursue their subject by using unusual materials, processes and techniques, “Drawn to Language” aims to encourage its audience to examine language in new ways."